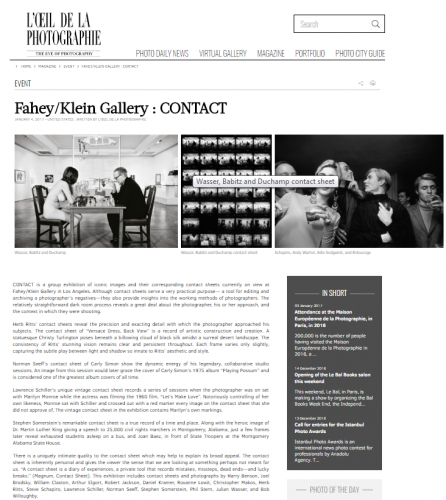 CONTACT is a group exhibition of iconic images and their corresponding contact sheets currently on view at Fahey/Klein Gallery in Los Angeles. Although contact sheets serve a very practical purpose— a tool for editing and archiving a photographer’s negatives—they also provide insights into the working methods of photographers. The relatively straightforward dark room process reveals a great deal about the photographer, his or her approach, and the context in which they were shooting. Herb Ritts’ contact sheets reveal the precision and exacting detail with which the photographer approached his subjects. The contact sheet of “Versace Dress, Back View” is a record of artistic construction and creation. A statuesque Christy Turlington poses beneath a billowing cloud of black silk amidst a surreal desert landscape. The consistency of Ritts’ stunning vision remains clear and persistent throughout. Each frame varies only slightly, capturing the subtle play between light and shadow so innate to Ritts’ aesthetic and style. Norman Seeff’s contact sheet of Carly Simon show the dynamic energy of his legendary, collaborative studio sessions. An image from this session would later grace the cover of Carly Simon’s 1975 album “Playing Possum” and is considered one of the greatest album covers of all time. Lawrence Schiller’s unique vintage contact sheet records a series of sessions when the photographer was on set with Marilyn Monroe while the actress was filming the 1960 film, “Let’s Make Love”. Notoriously controlling of her own likeness, Monroe sat with Schiller and crossed out with a red marker every image on the contact sheet that she did not approve of. The vintage contact sheet in the exhibition contains Marilyn’s own markings. Stephen Somerstein’s remarkable contact sheet is a true record of a time and place. Along with the heroic image of Dr. Martin Luther King giving a speech to 25,000 civil rights marchers in Montgomery, Alabama, just a few frames later reveal exhausted students asleep on a bus, and Joan Baez, in front of State Troopers at the Montgomery Alabama State House. There is a uniquely intimate quality to the contact sheet which may help to explain its broad appeal. The contact sheet is inherently personal and gives the viewer the sense that we are looking at something perhaps not meant for us. “A contact sheet is a diary of experiences, a private tool that records mistakes, missteps, dead ends—and lucky breaks.” (Magnum, Contact Sheet). This exhibition includes contact sheets and photographs by Harry Benson, Joel Brodsky, William Claxton, Arthur Elgort, Robert Jackson, Daniel Kramer, Roxanne Lowit, Christopher Makos, Herb Ritts, Steve Schapiro, Lawrence Schiller, Norman Seeff, Stephen Somerstein, Phil Stern, Julian Wasser, and Bob Willoughby.